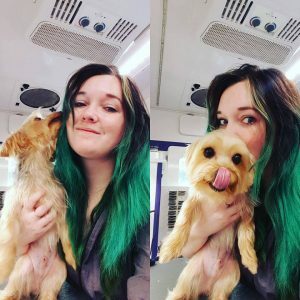 Here at Pretty Paws Mobile Salon we believe in treating your pets like family. We understand that multiple car rides, hours left in a kennel, and interaction with strange unfamiliar dogs can cause unnecessary stress for your pet. By providing a quality mobile grooming service we eliminate this stress by coming to you! Working with your pet in a one on one environment with little distractions we have found is the best environment for your pet. Not only are they calmer and happier but, they also receive undivided personalized attention. With a state of the art grooming van we have all of the tools needed to provide quality service right in your driveway. Our owner Chelsea Geyer has loved animals of every kind all of her life. She always knew that working with animals was her passion. She enjoys grooming dogs of every breed and firmly believes in treating each pet as though it were her own. She lives in Hiram, Georgia with her husband and two dogs Freyja & Lilah. Click on the link below to take a virtual tour of our Mobile Salon!